Disney INFINITY: Toy Box Starter Pack (2.0) - Xbox 360 Only $24.99! You are here: Home / Great Deals / Amazon Deals / Disney INFINITY: Toy Box Starter Pack (2.0) – Xbox 360 Only $24.99! Disney INFINITY: Toy Box Starter Pack (2.0) – Xbox 360 Only $24.99! Enter the new Toy Box 2.0 where you can mix match and mash up characters and worlds to create any adventure you can imagine! Team up as Merida and Stitch or purchase additional Disney Infinity (2.0 Edition) characters to power up your play! Use the new Creator tool to quickly build your worlds with ease. Create and share Toy Boxes online. Connect your Toy Box creations with friends. Play without limits! 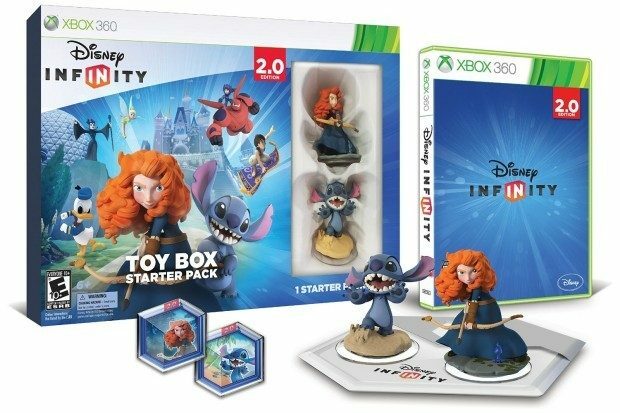 Get the Disney INFINITY: Toy Box Starter Pack (2.0 Edition) – Xbox 360 for Only $24.99! Save $35 now!